New Year's Eve: Dubai Puts On A Record-Setting Fireworks Show : The Two-Way Organizers of what is expected to be certified as the world's largest fireworks display ever put on a show in Dubai that was seen by thousands Tuesday, as viewers turned out to celebrate the new year and watch a huge spectacle. 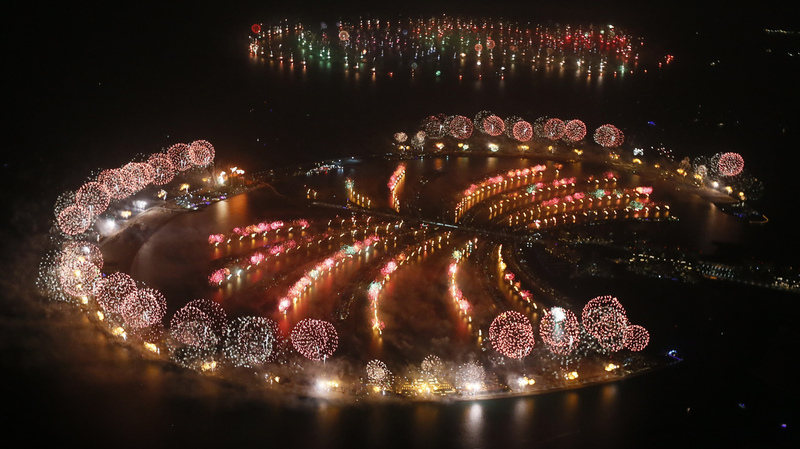 Fireworks explode over Palm Jumeirah in Dubai on Jan. 1, 2014, to celebrate the new year. Dubai's glittering fireworks display that lasted around six minutes spanned over 100 kilometres (60 miles) of the Dubai coast, which boasts an archipelago of man-made islands. Organizers of what has now been certified as the world's largest fireworks display ever put on a show in Dubai that was seen by thousands of people Tuesday, as viewers turned out to celebrate the new year and watch the spectacle. The show was also live-streamed on YouTube and on Dubai Media's website. Both the Dubai Media and the Guinness World Records' sites seemed to struggle with the crush of web traffic from people wanting to see the show. On the scene, the weather cooperated to give the audience a clear and dry night. A record 1.7 million people attended the event last year, according to Emirates 247. As Mark reported earlier, fireworks and parties are the hallmark of tonight, as people welcome the arrival of 2014. "Staring precisely 20 seconds before midnight local time, over 500,000 fireworks are set to be used during the display which is set to last around six minutes, with Guinness World Records adjudicators on hand to officiate the attempt. "Covering a distance of over 94km (61.6 miles) of the city's seafront, the display will incorporate some of Dubai's top landmarks, including Palm Jumeirah, World Islands, the Burj Khalifa and Burj Al Arab. "The spectacle's final salvo of fireworks will create an artificial 'sunrise' along the seafront, with the highest fireworks reaching more than one kilometre in height." The Dubai display was aimed at displacing a Guinness record held by Kuwait, reports Gulf News. By early evening, crowds of people had packed viewing areas, and multiple traffic jams were reported in the surrounding streets, according to local reports.